(Newser) – The "Doomsday Vault" sits on an Arctic Island, quietly helping to protect our future. At first, it mostly collected and stored food crops, but it recently got its first shipment of tree seeds, Wired reports. Norway spruce and Scots pine are, of course, not much of a meal, but they play a key ecological role, and researchers will use the seeds to track how forests change genetically over the years, the BBC reports. Seeds are "heat-sealed in four-ply packets," aiming to keep moisture out, Wired notes; they're stored at about -0.4 degrees Fahrenheit. 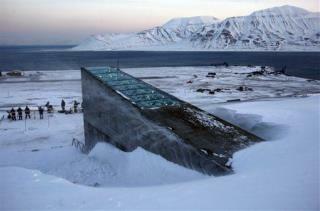 More protection comes from the Global Seed Vault's Svalbard location, where the soil is always frozen and the land is high enough to stay dry as seas rise. Good luck finding it if the overseers get killed. Hope they aren't all eaten by the North Vole!